Have you ever wondered why society in general so often, maybe even most of the time, avoids using the “D” words. Yes, I mean THOSE “D” words: death, dying, died, dead. Why is there such an aversion to using them anyway? I mean, they’re just words. A while back, I decided to start using the “D” words more. I’ve made a conscious effort to do it. Why this is, I do not know for sure. When I die don’t say I “passed.” That sounds like I walked by you in the corridor at school. When I die tell the world what happened. Plain and simple. No euphemisms, no flowery language, no metaphors…When I die someday just tell the truth: I lived, I died. The end. I used to go to support group meetings, (I stopped, but that’s a different post) and whenever we went around the table and did that introduction thing, besides telling a bit about myself, I’d mention that my mother died from metastatic breast cancer. I stopped saying, I lost my mother to mbc and started saying, my mother died from mbc. Reactions were different depending on how I phrased it. I always found that interesting. More recently, when people offered condolences after my dad died, they almost always said, I’m sorry for your loss. You might want to read, Things People Say at Funerals. Now, I’m certainly not saying there’s anything wrong with saying, I’m sorry for your loss. I say it, too, especially when I don’t know the person I’m saying it to that well. I’m pretty sure the intention behind phrasing it this way is to soften things up. To soften death up. As if that’s really possible. I’m sorry your dad died perhaps sounds more harsh, more concrete or more something. Yeah, even the title of her article, ‘marbles in my mouth,’ is good, right? In the article, Mannix writes about an experience 30 years prior in which an imminently terminal patient of hers directly asked, am I dying? The author’s response was, of course not, even though she knew full well that, in fact, the patient was dying. To this day, Mannix regrets not speaking more forthrightly with that patient because lo and behold, by the next morning, the patient had died. Mannix still carries around a certain amount of guilt for not being completely frank with that patient even though, of course, she needn’t. She realizes opportunities may have been missed. Last minute, final loving messages perhaps went unsaid. So, what if we started saying the “D words” out loud more often? What if we started talking more openly about, instead of avoiding, hard topics like death? What if when someone dies from cancer (or any illness), we just said that instead of turning into robots and saying, the person lost her/his battle? You might want to read, Stating a Person Lost Her/His Battle with Cancer Is Insulting. What if we started having honest conversations with terminal patients and their families about the process of dying, and what if we did it a whole lot earlier in the dying process? It’s certainly not like most dying patients aren’t aware. For example, when my mother was admitted to the hospital after becoming gravely ill from metastatic breast cancer, she was aware. Very aware. I’m pretty sure she was even wishing she could move the dying process along. One of the most moving conversations I observed during those difficult days, was one between my mother and her very kind and skilled doctor who actually got down on her knees beside my mother’s bed to chat. The sight of that alone was enough to bring me to tears. But the conversation that followed was what I’ve never forgotten. “Why is it taking me so long to die?” my mother point blank asked. Her doctor didn’t go into denial mode. Or false hope mode. Or clamming-up mode. Or diversion mode. She spoke candidly and truthfully. She remained in honesty mode. Even now, I get emotional thinking about it. Her doctor’s remarkable response and the manner in which it was delivered, took my breath away. So honest. So caring. So candid. So full of compassion and empathy. Sometimes people refrain from having frank conversations about death no matter where a patient falls on the dying continuum for fear of taking away hope. Mostly, we avoid the topic altogether whether we are healthy or otherwise. Where’s that line between reality and false hope to be drawn? I don’t know the answer either. Hope can be a tricky thing. But truth doesn’t need to be. 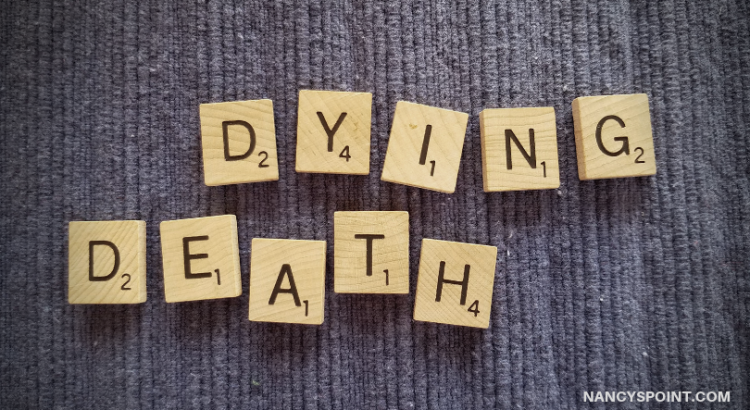 Maybe if we all started speaking more openly about death and starting using the “D” words with less hesitation, it would make at least some parts of the dying process a little easier for everyone, especially for the person dying. If you want to read more articles like this one, Click Here. If you like this post, please share it. Thank you! Why do you think people avoid using the “D” words so often? This blog is very timely for me. 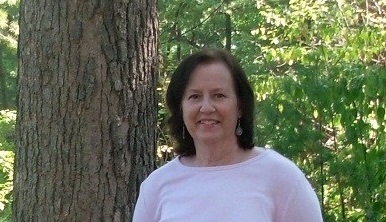 I am four months into a metastic breast cancer diagnosis. I am so tired of people telling me I will win this fight. Do they not realize that MBC is a terminal diagnosis? (And don’t get me started about couching my cancer journey in terms of a battle or fight!) Death is very real, although not immediately imminent, for me. I don’t want to use euphemisms or metaphors for what is going to happen to me. I am going to die and I need to be able to talk to people about that in a very real way. In the meantime, I have consciously stopped using alternatives to the D words, although, in all honesty, I only used euphemisms about a quarter of the time. I think people avoid the D words because it reminds them of their own mortality, which is, I think, the same reason they don’t want to acknowledge that my MBC is a terminal diagnosis. Janet, I’m glad this post resonated. I don’t blame you for feeling the way you do. You should never feel you have to sugarcoat your reality to protect someone else, unless you choose to do that for specific reasons. I hope you have some people you can confide in honestly. Like someone mentioned, saying the “D” words won’t cause death. People tend to tiptoe around hard topics. Speak your truth the way you want. Thank you for reading and sharing your thoughts on this. My best to you. I have never used the words “passed away.” They died. But I do notice a lot of people getting uncomfortable when I say DIED. My parents died nine weeks apart (8 years ago). They died. The hospice nurse who called me about my dad ‘actively dying’ didn’t miss words. And I appreciated it. Linda, I agree with Lisa B. Adams when she wrote that saying ‘passed’ sounds like I passed you in the school corridor. Words people choose to use and not use fascinates me. I’m glad that hospice nurse spoke forthrightly when your dad was dying. Speaks volumes that you took note, appreciated and remember that. Thank you for sharing. 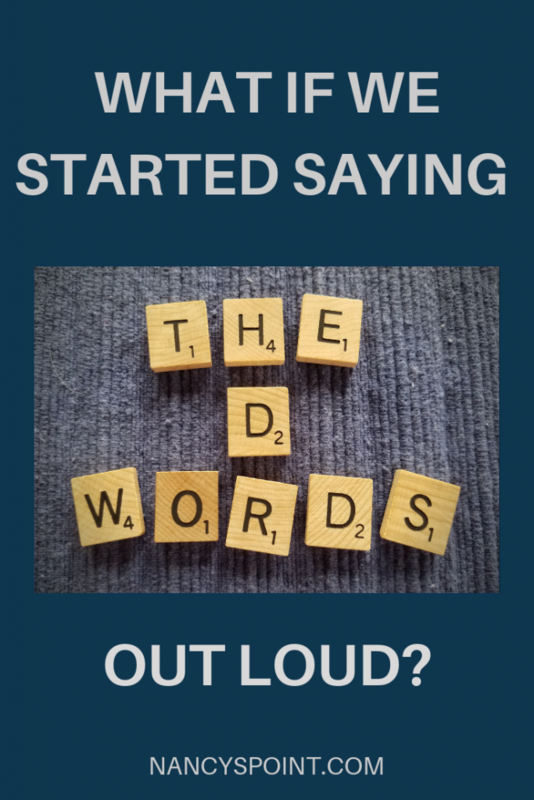 4 thoughts to “What If We Started Saying the “D” Words Out Loud More Often. Very interesting topic. I felt very sorry about who passed away with cancer. Nancy–I just had a chance to read this post and go back to some of Lisa Bonchek Adam’s deeply meaningful writing as well. My sister is dying of MBC. I find myself being more direct and honest with some members of my family, more reserved and protective with others. This post helps remind me that compassion and honesty are the best approach for all involved. The response the doctor gave your mom was so wonderfully kind and genuine. This is new territory for me to be in with a loved one, but your post helps me. Thank you! Lisa, I am very sorry that your sister’s metastatic breast cancer is progressing. I read your recent blog post about that. My heart goes out to you all. I think it’s natural that we are more direct with some family members than with others as every relationship is unique. And yes, that response my mother’s doctor gave her still makes me emotional. And it wasn’t just her words, but her delivery of them. I will be thinking about you and your dear ones as you go through this new territory. I am honored that my post might help in some small way. Thank you for reading and taking time to comment.